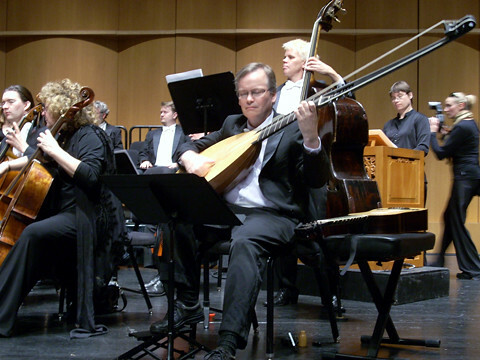 This past Saturday at the Mondavi Center in Davis, Philharmonia Baroque Orchestra and Chorale performed the final concert of their critically-acclaimed program dedicated to the English composer Henry Purcell. Conducted by Music Director Nicholas McGegan, the concert featured the all-sung masque Dido and Aeneas with mezzo-soprano Susan Graham, baritone William Berger, sopranos Cyndia Sieden and Céline Ricci, contralto Jill Grove and one of the Chorale's own tenors – Brian Thorsett. We captured a few shots backstage and during the dress rehearsal. Local photographer Randi Lynn Beach was on hand to take much better photos than ours to help publicize our 30th Anniversary (!!!) next season. Say "historically informed performance!" Say "continuo harpsichord!" How about just "cheeeeese!" Randi shoots Nic at the harpsichord. Randi shoots the orchestra as they practice Purcell's perky Suite from Abdelazar, a rather bizarre and gruesome play by Aphra Behn. Nic warms up the orchestra's smile muscles during a short interlude. They don't call him the "sunniest conductor in classical music" for nothing. Randi swoops in for another shot while the orchestra rehearses. Left to right, cellists Bill and Phoebe, lutist David (on theorbo), bassist Kristin and organist Hanneke. Our show stealers: the Chorale! See the rest of the photos on flickr!